Creator Direct: Technology update - could digital comics actually become pleasant to read? Technology update - could digital comics actually become pleasant to read? One of my big gripes with digital comics is that I simply don't like reading on screen. I'll often print long emails and web text to read on paper because it's a more pleasant reading experience. Since getting my Powerbook a few years ago, which has an amazing LCD display, it's been a little better, but still not on the same level as reading comics (or text) on paper. I've read articles before on flexible paper-like e-book displays and I'm absolutely excited about the technology. So now LG Philips is showing their prototypes of the flexible e-book displays and the negative seems to be that it's mostly useless for video and other highly dynamic content, but that also means it should be perfect for presenting comic content. The future of digital comic and quality presentation looks promising. LG Philips LCD presented prototype of 14.1-inch WXGA flexible E-book at IMID 2006 under cooperation with E-ink. Unlike conventional LCD TVs, it needs power when it turns pages. 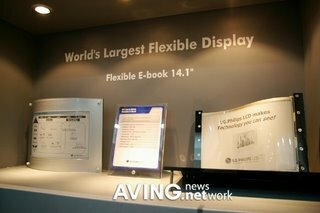 A researcher at LG Philips LCD said that it is possible to produce any slim E-book with this flexible display depending on the thickness of stainless steel. However, due to relatively slow response time (300ms), it can be good for making E-book whereas it would not be appropriate for playing video files.